These traps are an excellent choice when animals need to be trapped in populated areas because captured animals cannot be seen from the outside. These traps are made from durable polyethylene and formed into one solid piece. The solid frame construction protects animals from the environment and handlers from animals. It also prevents trapped animals from reaching outside the trap and damaging the surrounding area. And it prevents animals from reaching into the trap and steeling bait. These traps are an excellent choice when animals need to be trapped in populated areas because captured animals cannot be seen from the outside. And people cannot reach into the trap and disturb the animal. The Model 924 can be used for Cats, Rabbits, Skunks, Opossums, and similar sized animals. 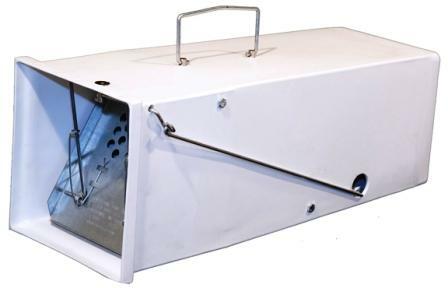 Our plastic traps feature very strong spring loaded doors that lock into place when the trap is set. The doors are made from 16 gauge Nickel Plated sheet steel, with 90 degree strength bends on all four outside edges. Model 924 is an excellent choice for skunk because it is completely enclosed. Dimensions: 24" x 9" x 9"
9/10/2014 – Is it possible to get this trap with a mortise lock mechanism? I caught two raccoons and one skunk in the last 3 months . . .